A misfit band of thieves unknowingly attempts to rob a sadistic serial killer and ends up trapped inside his torture den. Serial killer Jack Tucker murders a mother attempting to escape imprisonment in his cellar with her daughter Macy. Macy remains captured. Thieves Ollie and Blair prepare to conduct one final heist before retiring together. Their suburban robbery is interrupted when their target’s wife comes home unexpectedly to have an affair with her Pilates instructor. Ollie and Blair hide in the closet. The woman’s husband also comes home unexpectedly, forcing the Pilates instructor to hide in the closet with the thieves. The husband pulls a gun and everyone is forced out of hiding. Ollie and Blair escape in the commotion, but Ollie returns to the house to rescue the wife and her lover from the murderous husband. However, the husband shoots his wife and her lover and Ollie is arrested by the police. Blair is forced to give up all of the couple’s savings and go into debt to gangster Jimmy Song in order to bribe Ollie’s way out of prison. To earn back part of the cash owed to Jimmy Song, Blair agrees to work a heist planned by her hapless brother Connor, who Ollie blames for landing him in jail on previously botched robbery attempts. After much discussion, Connor reluctantly agrees to allow Ollie on the current job alongside Connor’s dimwitted crewmember Riley. The four thieves case a presumably empty vacation house which, unknown to them, doubles as Jack Tucker’s torture dungeon for serial killing victims. Entering through the skylight, the foursome discovers that there is no escape since all of the doors lock from the outside and an electronics jammer has disabled their cellphones. The group learns they are in a sadist’s lair after discovering a collection of torture videos shot in the house’s basement. Everyone enters a secret underground passage to look for the jamming device. Ollie pulls out wires in a fuse box and Blair places a brief call to 911 without knowing for certain if it fully went through. The group finds a young woman named Vivian Thorpe being held captive. With Jack using a series of sliding doors throughout the home to continually separate the four thieves and funnel them into various passageways, Connor and Riley become trapped with Vivian while Ollie and Blair try finding a cell phone signal once more. The door to Vivian’s chamber opens and she runs. Connor follows her, but Riley remains trapped when the door closes suddenly. Riley is decapitated soon thereafter. Ollie and Blair become trapped in another torture room. Vivian ends up in there with them. Although Vivian claims to have been held prisoner for weeks, Blair believes Vivian is lying because she notices a recent pedicure on the young woman’s feet. Ollie becomes separated from Blair and Vivian just as Sheriff Dennis arrives at the front door. While Jack placates the sheriff upstairs, Ollie, Blair, and Vivian are finally able to free themselves. As the sheriff is about to leave, Ollie and Blair burst from the house and attempt to explain their situation. Unsure of whom to believe, Sheriff Dennis holds everyone at gunpoint, including Jack. After the sheriff forces Ollie and Blair to cuff themselves to a post, Vivian runs outside and supports the couple’s story about Jack being dangerous. However, Vivian pulls a knife and stabs Sheriff Dennis. While Jack and Vivian finish killing the sheriff together, Ollie and Blair pick their handcuff locks and flee back inside the house. Connor resurfaces and escorts Ollie and Blair back downstairs where he shows them the control room that operates the house’s door system. The trio works out a plan to take down the killers. While Connor operates the doors, Jack and Vivian chase Ollie and Blair. Ollie and Blair eventually trap Jack and hang him using a cable pulley. Connor douses Vivian with acid, but she escapes. Connor reunites with Ollie and Blair. Vivian attacks suddenly and Ollie slices her throat with a small Swiss army knife. To make sure that he is truly dead, Blair insists that Ollie crush Jack’s skull with a pipe just as Jack begins showing a twinge of life. A clip of a home video dated September 30th, 1995 reveals that Vivian Thorpe was actually kidnapped girl Macy rechristened, brainwashed, and raised by Jack to become his accomplice. “Crush the Skull” is a horror-crime thriller with a thick swath of dark humor, although you wouldn’t be sure about that last bit by the way the movie undersells itself as comedic. Before spinning into a full-length film, “Crush the Skull” initially earned Fantastic Fest fame as a fan favorite short that tugged playfully at expectations by twisting tired tropes, always winking slyly with a tongue jutting from between its lips. Either the cleverness in that concept can’t find its footing as a feature, or the direction is hesitant to let the same smarmy charm play loose with higher budget stakes, but the rhythm here is hobbled. “Crush the Skull” can be entertaining. Yet the tempo is mistuned enough that laughs come tentatively, as though unsure if the movie actually provides permission to find it funny. After a poorly-timed extramarital affair unexpectedly populates the bedroom of a house targeted by thieves Ollie and Blair, the couple finds themselves in debt to a mobster who bails them out of their jam. Forced to throw in on a slapdash heist plan orchestrated by Blair’s hapless brother Connor and his hip-hop wannabe sidekick Riley, Ollie and Blair unknowingly end up robbing the vacation home of a deadly serial killer. Trouble is, said killer is not away from the property like everyone thought. Once inside, the fumbling foursome discovers that all doors are locked from outside and a cellphone jammer is blocking outgoing calls. There is no escape. And they are not alone. 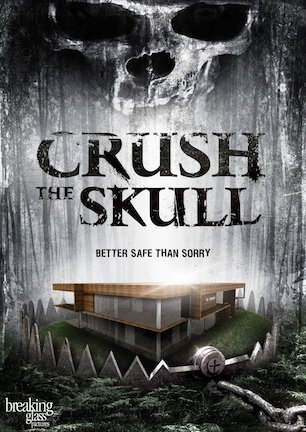 Despite the description, “Crush the Skull” is not a bumbling madcap romp. It’s not a tightly tied torture suspense yarn either, no matter how much its premise might sound somewhat similar to “The Collector” (review here). “Crush the Skull” aims at being a Jack of both trades, and in the course of so doing becomes a master of neither. The needle between its two tones stays close to a safe center when it needs to ping further in one direction or the other to fully break free. Going in blind, there is no overt indication from the opening that black comedy comes into play. An early shot is of a creepy doll head. A child is chained in a windowless room of cement brick. A mother attempting a rescue meets a grisly end for her effort as a jump cut back to the creepy doll head unnecessarily repeats the clichéd visual. When hints of absurdist humor eventually enter, the sudden shift moves the mood into a different-feeling film altogether. This kind of approach requires an ability to switch seamlessly between styles without making the movie seem out of synch with itself the way “Crush the Skull” does. The actors are apparently instructed to play their parts straight and read lines with realism, except jokes do not always filter through the delivery. I criticize genre blends when they take things over-the-top, but this is a case where subtlety cuts off creativity. The cast appears to be doing the jobs they are called to do, but the direction can’t corral all of the elements together into a singularly consistent cadence. “Crush the Skull” is always choosing one atmosphere or the other, and it makes for a disorienting experience overall. The idea is a lot of fun, and it does work at times, just not reliably. The story loses steam because the techniques used for telling it are an amalgam of styles that do not always fit the atmosphere. An obvious culprit in that department is a dated shaky camera that fell out of fashion when “NYPD Blue” went off the air. Employing unmotivated zooms and sudden bobs even in simple scenes of two seated people talking, the camerawork makes it look like the operator is being continuously bumped by careless crewmembers behind the scenes. A better movie exists here than the one “Crush the Skull” ends up being. While the effort onscreen from everyone involved shows passion for the project, something is off about the rhythm, and it stays off for the duration. The characters and the concept come just close enough that the movie still captures some of the promise that the shorts showed. Things just don’t quite coalesce into a tone that can hit hard on the horror while still staying humorous at the same time. June 12, 2015 by Ian Sedensky.